Member of the Sunrise Movement protest for action on climate change in Washington. Polls conducted around the midterm elections suggest more voters are choosing climate change as their top priority. A corps of young people are demanding action from politicians. Even among Republican millennials, a third say the Earth is warming because of human activity. Going into the midterm elections, few candidates made the warming planet a keystone of their campaigns despite devastating fires and storms that scientists say have been worsened by carbon pollution. Climate change has typically been low on voters’ lists of priorities. But as a new Congress comes into power in January, that indifference could be changing. Surveys conducted for the midterms found that between 7 and 9 percent of the electorate named climate change or the environment as the top issue facing the country. Typically, the number lags around 2 percent, environmentalists say. “That’s a green wave,” said Nathaniel Stinnett, the founder of the Environmental Voter Project, a three-year-old organization that is dedicated to getting environmentalists to vote. Americans continue to voice more concern about health care, immigration, the economy and jobs, and depending on the poll, gun policy or federal taxes and spending. But with a record 113 million people voting in this year’s elections where Democrats retook control of the House, that could mean that up to 9 million named the environment their primary concern. “That’s an enormously powerful constituency and I think you’re going to see more and more politicians trying to appeal to these environmental voters, especially among those running in the  Democratic presidential primary,” Stinnett said. The surveys -- one around Election Day called AP VoteCast and two conducted for NPR and PBS NewsHour by the Marist Poll, in October and after the election -- are just one indication that climate change is taking on urgency with voters, particularly young voters. Also pointing to the increased seriousness with which the issue is being treated: differences between millennials and older Americans, demands from newly elected politicians and worry about the damage that climate change is already doing to communities from Miami to Los Angeles. A confluence of factors is driving the new attention to the devastation threatening the environment. Repeated natural disasters have brought havoc to parts of the United States, from deadly fires in California to destructive hurricanes sweeping over Puerto Rico, Florida, Texas and the Carolinas. Warnings about the world’s need to curb the use of fossil fuels come as younger people more convinced of the scientific consensus on climate change become old enough to vote. Going into the New Year, there will be more pressure on Congress to tackle the greenhouse gases that are raising temperatures. Here’s a breakdown of the polls. AP VoteCast found that more of the electorate, 26 percent, choose health care as the number one issue facing the country than any other issue while 7 percent picked the environment. The Marist Poll in October recorded 7 percent of registered voters choosing climate change as the most important factor in deciding their vote and earlier this month, 9 percent saying that it should be Congress' top priority. Economy and jobs was the most important for the most voters, with 20 percent in October and 17 percent this month. Stinnett said that how much change was occuring would become clearer as more data becomes available about voters and the midterm elections. Young people are particularly engaged in confronting climate change, a crisis that has gathered momentum throughout their lives and which threatens to leave the Earth a much less hospitable place in the coming years. A pre-election survey from Tufts University that focused on young people and politics found that 59 percent of 18- to 24-year-olds support or are an active part of the environmental movement, up from 42 percent in 2016. Numbers were even higher among Democrats, and particularly those who said they were likely to vote, according to the September poll by the university’s CIRCLE, or The Center for Information & Research on Civic Learning and Engagement. The poll’s director, Kei Kawashima-Ginsberg, said political engagement was more common among young people now than two years ago, with triple the number saying they attend marches and demonstrations — up from 5 percent to 15 percent. Part of the change can be traced to the activism of students from Parkland, Florida, which encouraged other young people to be a part of political causes, including the environmental movement, she said. “It wasn’t drowned out by gun violence, for example, which is a big player this year, but just as many people if not more young people said, ’It’s a really important issue that I’m actively engaged in,’” she said. The Sunrise Movement is a corps of young people working to make climate change an urgent priority across the country. As they prepared to launch, a core challenge was how to make climate change an urgent priority in the United States. They helped Democrats to take the House and now are determined to keep the issue at the top of lawmakers’ agendas. 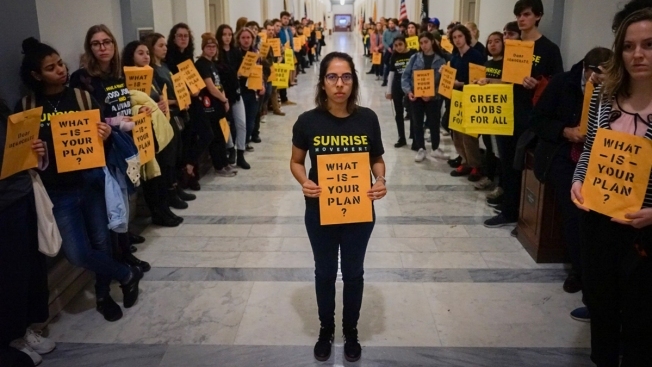 In November, 150 members of the Sunrise Movement and Justice Democrats held a sit-in at House Minority Leader Nancy Pelosi’s office on Capitol Hill to demand action on climate change. They were joined by newly elected Rep. Alexandria Ocasio-Cortez of New York, who has been pushing for a Green New Deal to promote green energy and jobs and cut carbon emissions. "She was elected as part of the movement, she intends to govern as part of the movement," Corbin Trent, a spokesman for Ocasio-Cortez, said at the time. ”She thinks there is no other priority that we should be focused on and supports the Sunrise Movement’s call for Democrats to create a plan to transition the economy to a zero carbon economy so we have that ready to go when we take back the presidency in 2020." 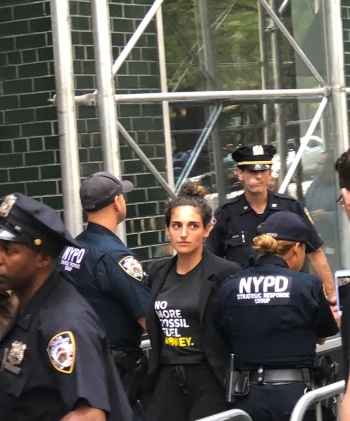 The activists were criticized for targeting Democrats, who support taking on climate change, but they say they know that if they do not push Democrats they will not get the action they need. They believe that as young people they have leverage over Democrats because it was young people turning out in record numbers that helped Democrats win the House majority. If Democrats are to win the presidency and the Senate in 2020, they will need young people again to turn out in record numbers, O’Hanlon said. Republicans have been the most resistant to believing that climate change presents a critical danger. A Pew Research Center poll done before the midterms found that 72 percent of registered voters supporting Democrats thought climate change was a “very big” problem compared to only 11 percent of those backing Republicans. But other Pew surveys found wide differences within the GOP. About a third of Republican millennials say the Earth is warming because of human activity, double the share of Baby Boomers and older, according to a May survey. Forty-five percent of millennials say they are seeing some effects of global climate change in their communities, compared with a third of older Republicans. But they also are in agreement with older party members that policies aimed at reducing climate change effects would make no difference. Sara Blazevic, a co-founder and managing director of the Sunrise Movement, said the organization was made up of young people angry and frustrated after having watched a lifetime of political inaction, of witnessing hurricanes and other disasters getting worse but the environmental movement stagnating. Other Pew research ranks the public’s policy priorities for the president and Congress. Protecting the environment has risen from 44 percent in January 2010 to 62 percent at the beginning of this year. Dealing with climate change similarly rose from 28 percent to 46 percent. In December, nearly 200 countries met in Poland for the U.N.’s 24th annual climate change conference and agreed to rules for curbing greenhouse emissions, but delayed a decision on creating a market in carbon credits. The meeting follows a series of reports, among them the National Climate Assessment and one from the United Nations Intergovernmental Panel on Climate Change, warning of irreversible environmental damage absent quick action to rein in carbon emissions. During the midterm elections, ads highlighting global warming began appearing in races across the country, a phenomenon that was new. The League of Conservation Voters through its Victory Fund was among environmental groups that spent heavily to elect “green” candidates, in its case $80 million. Pete Maysmith, its senior vice president of campaigns, said that the more environmental issues were localized, the more voters responded. In southern New Jersey, the organization matched environmental concerns with what it knew would be the top issue of the elections, health care, then targeted what it viewed as an important bloc of swing voters, suburban women. In a tight race, Democrat Andy Kim, a former national security aide in the Obama administration, defeated two-term Republican Rep. Tom MacArthur, who had tried to repeal the Affordable Care Act. “When you pair the issue of pollution, whether it’s water or air pollution — so you’re talking about healthy drinking water, you’re talking about concerns around asthma and other illnesses, other disease — and then link that into the health care debate, that again is a very powerful motivator,” he said. The League of Conservation Voters’ Victory Fund and the Environmental Defense Fund Action connected “the health impact of MacArthur’s record of gutting environmental protections and allowing more toxic pollution into our air to his efforts to eliminate protections for people with pre-existing conditions,” according to post-election analysis. Maysmith’s colleague, Tiernan Sittenfeld, the senior vice president of government affairs, said of the 62 new members of the House of Representatives, 55 of them have committed to trying to bring about 100 percent clean energy by 2050. She said the organization was looking at opportunities for a “green” infrastructure package from the Democrat-dominated House and oversight as the Trump administration tries to roll back public health and environmental protections. “It’s especially exciting because there are so many of these new members for whom the environment and addressing the climate crisis is really an enormous priority and central to who they are and in many case part of why they decided to run,” she said. The AP VoteCast survey replaced exit polling that The Associated Press had participated in with the television networks. It was conducted for the AP and Fox News by the non-partisan research organization NORC at the University of Chicago. The AP VoteCast also found that significant numbers were concerned about the effects of climate: 70 percent of all voters were very or somewhat concerned versus 29 percent who were not too or not at all concerned. Democrats were more worried than Republicans. This year’s exit polling, which NBC and other networks continued separately, did not ask voters across the country to rate the environment among their top issues, but it did ask voters in Florida about climate change as it had done in 2016 and in both years, 66 percent said climate change was a serious problem. Over the last decade, the environment has historically ranked low among voters’ priorities. Polling that the Environmental Voter Project did of likely voters in the 2016 presidential election found that only 2 percent listed the environment as their top priority, with another 2 percent setting it as their second highest priority. The Environmental Voter Project targets environmentalists who don’t vote or who seldom vote to convince them to change their behavior. It focuses on the 18- to 24-year-olds and to a lesser extent 25- to 29-year-olds who are disproportionately likely to care deeply about environmental issues. Blacks and Hispanics and those who make less than $50,000 a year — and who have a higher chance of being victims of environmental racism — are also in their sights. Stinnett estimates that the non-profit has turned more than 100,000 non-voting environmentalists into consistent voters since it started. It began in Massachusetts, in 2017 moved into Georgia, Colorado, Florida, Nevada and Pennsylvania and expects to expand further into about 20 states where it has identified large populations of non voting environmentalists. It does not spend money on changing minds, just getting people to the polls. “This electorate might not force change as quickly as we want it to, but something’s happening, something is absolutely happening and politicians are beginning to pay attention,” Stinnett said.